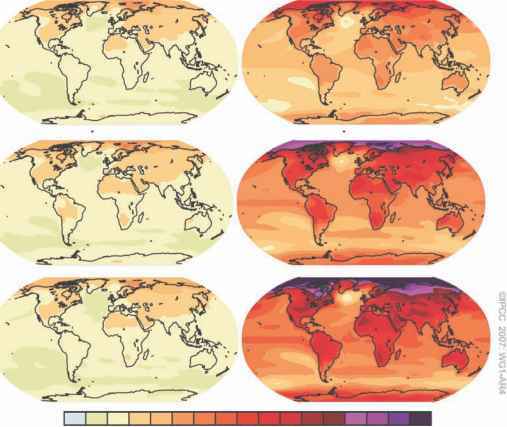 This chapter provides an overview of global climate models and their predictions for climate through the 21st century. The review examines the scientific basis of global climate modelling, including the bases for uncertainty in future climate projections. A summary of the Special Report Emissions Scenarios (SRES) is also provided. The current scientific knowledge on climate change points to increases in temperature of 1-3°C to 2050 combined with some complex spatially explicit changes in rainfall. There remains high uncertainty in predictions of extreme events, especially hurricanes. The chapter then looks at the likely impacts of climate change on agricultural productivity, pest and disease prevalence, and CO2-based fertilization. The impacts on crop productivity are likely to be negative. While moderate increases in temperature may bring about moderate increases in productivity, beyond 1°C of warming the literature tends to agree that impacts will be negative. However, possible CO2-fertilization effects may cancel out these losses, although significant debate exists as to the extent of CO2 fertilization to expect. While most literature predicts increases in the prevalence of agricultural pests and diseases, only a handful of studies have quantified possible impacts and further research is needed in this area.